GoldMine Premium Edition is a cost-effective CRM product that helps you to manage every aspect of your business relationships. Created for medium-sized companies, GoldMine Premium Edition enables you to turn more of your opportunities into closed sales. 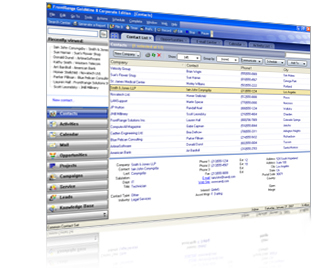 GoldMine Premium Edition is a modern product that is based on twenty years of industry-leading CRM experience. GoldMine led the way when it started, and it still leads the way now. GoldMine is powerful, robust, scaleable and easy to use. GoldMine can be configured to match your requirements and is flexible enough to be used successfully in a diverse range of industries and applications. A whole ecosystem of add-ons expand the possibilities even more. Have GoldMine on your phone or tablet, or access it over the web. We know that many people are thinking these days about cloud-based systems. However, an on-premise system still has some solid advantages by living on your own server, in your own offices: you own the software rather than renting it, and your data remains in sight the whole time - so you always have complete control over it. Alternatively, with GoldMine Cloud, being Desktop-As-A-Service, you can have the best of both worlds! Have a real-time view of the world through comprehensive dashboards and reporting. 1.7 million users can't be wrong! We have many clients who have been with GoldMine all the way from version 1 right up to version 9 and who are as happy with their choice now as they were ten years ago...and they're being joined by a constant stream of new companies and new satisfied customers. Our customers haven't stood still, and neither has GoldMine. To learn more, just give us a ring on 020 7549 1618 or email us here.